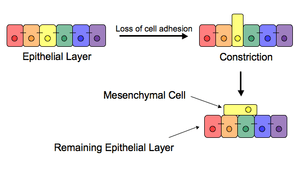 The epithelial–mesenchymal transition (EMT) is a process by which epithelial cells lose their cell polarity and cell-cell adhesion, and gain migratory and invasive properties to become mesenchymal stem cells; these are multipotent stromal cells that can differentiate into a variety of cell types. EMT is essential for numerous developmental processes including mesoderm formation and neural tube formation. EMT has also been shown to occur in wound healing, in organ fibrosis and in the initiation of metastasis for cancer progression. The epithelial-mesenchymal transition was first recognized as a feature of embryogenesis. EMT, and its reverse process, MET (mesenchymal-epithelial transition) are critical for development of many tissues and organs in the developing embryo, and numerous embryonic events such as gastrulation, neural crest formation, heart valve formation, palatogenesis and myogenesis. Epithelial and mesenchymal cells differ in phenotype as well as function. Epithelial cells are closely connected to each other by tight junctions, gap junctions and adherens junctions, have an apico-basal polarity, polarization of the actin cytoskeleton and are bound by a basal lamina at their basal surface. Mesenchymal cells, on the other hand, lack this polarization, have a spindle-shaped morphology and interact with each other only through focal points. Epithelial cells express high levels of E-cadherin, whereas mesenchymal cells express those of N-cadherin, fibronectin and vimentin. Thus, EMT entails profound morphological and phenotypic changes to a cell. Based on the biological context, EMT has been categorized into 3 types - developmental (Type I), fibrosis and wound healing (Type II), and cancer (Type III). Loss of E-cadherin is considered to be a fundamental event in EMT. Many transcription factors (TFs) that can repress E-cadherin directly or indirectly can be considered as EMT-TF (EMT inducing TFs). SNAI1/Snail 1, SNAI2/Snail 2 (also known as Slug), ZEB1, ZEB2, E47 and KLF8 (Kruppel-like factor 8) can bind to E-cadherin promoter and repress its transcription, whereas factors such as Twist, Goosecoid, E2.2 (also known as TCF4), homeobox protein SIX1 and FOXC2 (fork-head box protein C2) repress E-cadherin indirectly. SNAIL and ZEB factors bind to E-box consensus sequences on the promoter region, while KLF8 binds to promoter through GT boxes. These EMT-TFs not only directly repress E-cadherin, but also repress transcriptionally other junctional proteins, including claudins and desmosomes, thus facilitating EMT. On the other hand, transcription factors such as grainyhead-like protein 2 homologue (GRHL2), and ETS-related transcription factors ELF3 and ELF5 are downregulated during EMT - rather they actively drive MET when overexpressed in mesenchymal cells. Since EMT in cancer progression recaptures EMT in developmental programs, many of the EMT-TFs are involved in promoting metastasis. Several signaling pathways (TGF-beta, FGF, EGF, HGF, Wnt/beta-catenin and Notch) and hypoxia may induce EMT. In particular, Ras-MAPK has been shown to activate Snail and Slug. Slug triggers the steps of desmosomal disruption, cell spreading, and partial separation at cell–cell borders, which comprise the first and necessary phase of the EMT process. On the other hand, Slug cannot trigger the second phase, which includes the induction of cell motility, repression of the cytokeratin expression, and activation of vimentin expression. Snail and Slug are known to regulate the expression of isoforms of another transcription factor p63 that is required for proper development of epithelial structures. The altered expression of p63 isoforms reduced cell–cell adhesion and increased the migratory properties of cancer cells. The p63 factor is involved in inhibiting EMT and reduction of certain p63 isoforms may be important in the development of epithelial cancers. Some of them are known to regulate the expression of cytokeratins. Recently, activation of the phosphatidylinositol 3' kinase (PI3K)/AKT axis is emerging as a central feature of EMT. Similarly, Hedgehog, nuclear factor-kappaB and Activating Transcription Factor 2 have been implicated to be involved in EMT. Wnt signaling pathway regulates EMT in gastrulation, cardiac valve formation and cancer. Activation of Wnt pathway in breast cancer cells induces the EMT regulator SNAIL and upregulates the mesenchymal marker, vimentin. Also, active Wnt/beta-catenin pathway correlates with poor prognosis in breast cancer patients in the clinic. Similarly, TGF-beta activates the expression of SNAIL and ZEB to regulate EMT in heart development, palatogenesis and cancer. The breast cancer bone metastasis has activated TGF-beta signaling, which contributes to the formation of these lesions. However, on the other hand, p53, a well-known tumor suppressor, represses EMT by activating the expression of various microRNAs - miR-200 and miR-34 that inhibit the production of protein ZEB and SNAIL, and thus maintain the epithelial phenotype. After the initial stage of embryogenesis, the implantation of the embryo and the initiation of placenta formation are associated with EMT. The trophoectoderm cells undergo EMT to facilitate the invasion of endometrium and appropriate placenta placement, thus enabling nutrient and gas exchange to the embryo. Later in embryogenesis, during gastrulation, EMT allows the cells to ingress in a specific area of the embryo - the primitive streak in amniotes, and the ventral furrow in Drosophila. The cells in this tissue express E-cadherin and apical-basal polarity. Since gastrulation is a very rapid process, E-cadherin is repressed transcriptionally by Twist and SNAI1 (commonly called Snail), and at the protein level by P38 interacting protein. The primitive streak, through invagination, further generates mesoendoderm, which separates to form a mesoderm and an endoderm, again through EMT. Mesenchymal cells from the primitive streak participate also in the formation of many epithelial mesodermal organs, such as notochord as well as somites, through the reverse of EMT, i.e. mesenchymal–epithelial transition. Amphioxus forms an epithelial neural tube and dorsal notochord but does not have the EMT potential of the primitive streak. In higher chordates, the mesenchyme originates out of the primitive streak migrates anteriorly to form the somites and participate with neural crest mesenchyme in formation of the heart mesoderm. In vertebrates, epithelium and mesenchyme are the basic tissue phenotypes. During embryonic development, migratory neural crest cells are generated by EMT involving the epithelial cells of the neuroectoderm. As a result, these cells dissociate from neural folds, gain motility, and disseminate to various parts of the embryo, where they differentiate to many other cell types. Also, craniofacial crest mesenchyme that forms the connective tissue forming the head and face, is formed by neural tube epithelium by EMT. EMT takes place during the construction of the vertebral column out of the extracellular matrix, which is to be synthesized by fibroblasts and osteoblasts that encircle the neural tube. The major source of these cells are sclerotome and somite mesenchyme as well as primitive streak. Mesenchymal morphology allows the cells to travel to specific targets in the embryo, where they differentiate and/or induce differentiation of other cells. During wound healing, keratinocytes at the border of the wound undergo EMT and undergo re-epithelialization or MET when the wound is closed. Snail2 expression at the migratory front influences this state, as its overexpression accelerates wound healing. Similarly, in each menstrual cycle, the ovarian surface epithelium undergoes EMT during post-ovulatory wound healing. Initiation of metastasis requires invasion, which is enabled by EMT. Carcinoma cells in primary tumor lose cell-cell adhesion mediated by E-cadherin repression and break through the basement membrane with increased invasive properties, and enter the bloodstream through intravasation. Later, when these circulating tumor cells (CTCs) exit the bloodstream to form micrometastases, they undergo MET for clonal outgrowth at these metastatic sites. Thus, EMT and MET form the initiation and completion of the invasion-metastasis cascade. EMT confers resistance to oncogene-induced premature senescence. Twist1 and Twist2, as well as ZEB1 protects human cells and mouse embryonic fibroblasts from senescence. Similarly, TGFβ can promote tumor invasion and evasion of immune surveillance at advanced stages. When TGFβ acts on activated Ras-expressing mammary epithelial cells, EMT is favored and apoptosis is inhibited. This effect can be reversed by inducers of epithelial differentiation, such as GATA-3. EMT has been shown to be induced by androgen deprivation therapy in metastatic prostate cancer. Activation of EMT programs via inhibition of the androgen axis provides a mechanism by which tumor cells can adapt to promote disease recurrence and progression. Brachyury, Axl, MEK, and Aurora kinase A are molecular drivers of these programs, and inhibitors are currently in clinical trials to determine therapeutic applications. EMT has been indicated to be involved in acquiring drug resistance. Gain of EMT markers was found to be associated with the resistance of ovarian carcinoma epithelial cell lines to paclitaxel. Similarly, SNAIL also confers resistance to paclitaxel, adriamycin and radiotherapy by inhibiting p53-mediated apoptosis. Furthermore, inflammation, that has been associated with the progression of cancer and fibrosis, was recently shown to be related to cancer through inflammation-induced EMT. Thus, EMT not only enables cells the migratory phenotype, but also acts on multiple immunosuppression, drug resistance, evasion of apoptosis, thus showing an altered response of the host to the tumor. Some evidence suggests that cells that undergo EMT gain stem cell-like properties, thus giving rise to Cancer Stem Cells (CSCs). Upon transfection by activated Ras, a subpopulation of cells exhibiting the putative stem cell markers CD44high/CD24low increases with the concomitant induction of EMT. Also, ZEB1 is capable of conferring stem cell-like properties, thus strengthening the relationship between EMT and stemness. This property conferred by EMT is thus doubly dangerous duo for the patient, as it not only enables the carcinoma cells to enter the bloodstream, but also endows them with properties of stemness by virtue of which these cells have increased tumorigenic and proliferative potential. However, recent studies have further shifted the primary effects of EMT away from invasion and metastasis, toward resistance to chemotherapeutic agents. Research on breast cancer and pancreatic cancer both demonstrated no difference cells' in metastatic potential upon acquisition of EMT. These are in agreement with another study showing that the EMT transcription factor TWIST actually requires intact adherens junctions in order to mediate local invasion in breast cancer. The effects of EMT and its relationship to invasion and metastasis may therefore be highly context specific. Similar to generation of Cancer Stem Cells, EMT was demonstrated to generate endocrine progenitor cells from human pancreatic islets. Initially, the human islet-derived progenitor cells (hIPCs) were proposed to be better precursors since β-cell progeny in these hIPCs inherit epigenetic marks that define an active insulin promoter region. However, later, another set of experiments suggested that labelled β-cells de-differentiate to a mesenchymal-like phenotype in vitro, but fail to proliferate; thus initiating a debate. Since these studies in human islets lacked lineage-tracing analysis, these findings from irreversibly tagged beta cells in mice were extrapolated to human islets. Thus, using a dual lentiviral and genetic lineage tracing system to label β-cells, it was convincingly demonstrated that adult human islet β-cells undergo EMT and proliferate in vitro. Also, these findings were confirmed in human fetal pancreatic insulin-producing cells, and the mesenchymal cells derived from pancreatic islets can undergo the reverse of EMT - MET - to generate islet-like cell aggregates. Thus, the concept of generating progenitors from insulin-producing cells by EMT or generation of Cancer Stem Cells during EMT in cancer may have potential for replacement therapy in diabetes, and call for drugs targeting inhibiting EMT in cancer. Not all cells undergo a complete EMT, i.e. losing their cell-cell adhesion and gaining solitary migration characteristics. Instead, most cells undergo partial EMT, a state in which they retain some cell-cell adhesion, and gain migratory traits, thus cells in this hybrid epithelial/mesenchymal phenotype are endowed with special properties such as collective cell migration. In the first mathematical modeling work on partial EMT, Tian et al proposed a coupled bistable switches mechanism, in which the SNAIL1/miR-34 double-negative feedback loop is responsible for the reversible switch and regulates the transition between epithelial and partial EMT, whereas the ZEB/miR-200 feedback loop is accountable for the irreversible switch and controls the transition between partial EMT and mesenchymal. Later, they verified their predictions in MCF10A cell line. ↑ Kong D, Li Y, Wang Z, Sarkar FH (2011). "Cancer Stem Cells and Epithelial-to-Mesenchymal Transition (EMT)-Phenotypic Cells: Are They Cousins or Twins?". Cancers (Basel). 3 (1): 716–29. doi:10.3390/cancers30100716. PMC 3106306 . PMID 21643534. ↑ Thiery JP, Acloque H, Huang YJ, Nieto MA (2009). "Epithelial-Mesenchymal Transitions in Development and Disease". Cell. 139 (5): 871–890. doi:10.1016/j.cell.2009.11.007. ↑ Thiery JP, Sleeman JP (2006). "Complex networks orchestrate epithelial-mesenchymal transitions". Nature Reviews Molecular Cell Biology. 7: 131–142. doi:10.1038/nrm1835. ↑ Phua, YL; Martel, N; Pennisi, DJ; Little, MH; Wilkinson, L (April 2013). "Distinct sites of renal fibrosis in Crim1 mutant mice arise from multiple cellular origins.". The Journal of pathology. 229 (5): 685–96. doi:10.1002/path.4155. PMID 23224993. ↑ Kalluri R, Weinberg RA (2009). "The basics of epithelial-mesenchymal transition". Journal of Clinical Investigation. 119 (6): 1420–1428. doi:10.1172/JCI39104. PMC 2689101 . PMID 19487818. ↑ Peinado H, Olmeda D, Cano A (2007). "Snail, Zeb and bHLH factors in tumour progression: an alliance against the epithelial phenotype?". Nature Reviews Cancer. 7 (6): 415–428. doi:10.1038/nrc2131. ↑ Yang J, Weinberg RA (2008). "Epithelial-mesenchymal transition: at the crossroads of development and tumor metastasis". Dev Cell. 14 (6): 818–829. doi:10.1016/j.devcel.2008.05.009. PMID 18539112. ↑ De Craene B, Berx G (2013). "Regulatory networks defining EMT during cancer initiation and progression". Nature Reviews Cancer. 13: 97–110. doi:10.1038/nrc3447. ↑ Chakrabarti R, Hwang J, Andres Blanco M, Wei Y, Lukačišin M, Romano RA, Smalley K, Liu S, Yang Q, Ibrahim T, Mercatali L, Amadori D, Haffty BG, Sinha S, Kang Y (2012). "Elf5 inhibits the epithelial-mesenchymal transition in mammary gland development and breast cancer metastasis by transcriptionally repressing Snail2". Nat Cell Biol. 14 (11): 1212–1222. doi:10.1038/ncb2607. ↑ Savagner P, Yamada KM, Thiery JP (1997). "The zinc-finger protein slug causes desmosome dissociation, an initial and necessary step for growth factor-induced epithelial–mesenchymal transition". J Cell Biol. 137 (6): 1403–19. doi:10.1083/jcb.137.6.1403. PMC 2132541 . PMID 9182671. ↑ Boyer B, Tucker GC, Vallés AM, Franke WW, Thiery JP (1989). "Rearrangements of desmosomal and cytoskeletal proteins during the transition from epithelial to fibroblastoid organization in cultured rat bladder carcinoma cells" (PDF). J Cell Biol. 109 (4 Pt 1): 1495–509. doi:10.1083/jcb.109.4.1495. PMC 2115780 . PMID 2677020. ↑ Herfs M, Hubert P, Suarez-Carmona M, Reschner A, Saussez S, Berx G, Savagner P, Boniver J, Delvenne P (2010). "Regulation of p63 isoforms by snail and slug transcription factors in human squamous cell carcinoma". Am J Pathol. 176 (4): 1941–49. doi:10.2353/ajpath.2010.090804. PMC 2843482 . PMID 20150431. ↑ Lindsay J, McDade SS, Pickard A, McCloskey KD, McCance DJ (2011). "Role of DeltaNp63gamma in epithelial to mesenchymal transition". J Biol Chem. 286 (5): 3915–24. doi:10.1074/jbc.M110.162511. PMC 3030392 . PMID 21127042. ↑ Boldrup L, Coates PJ, Gu X, Nylander K (2007). "DeltaNp63 isoforms regulate CD44 and keratins 4, 6, 14 and 19 in squamous cell carcinoma of head and neck". J Pathol. 213 (4): 384–91. doi:10.1002/path.2237. PMID 17935121. ↑ Vlahopoulos SA, Logotheti S, Mikas D, Giarika A, Gorgoulis V, Zoumpourlis V (Apr 2008). "The role of ATF-2 in oncogenesis". BioEssays. 30 (4): 314–27. doi:10.1002/bies.20734. PMID 18348191. ↑ Huber MA, Beug H, Wirth T (Dec 2004). "Epithelial-mesenchymal transition: NF-kappaB takes center stage". Cell Cycle. 3 (12): 1477–80. doi:10.4161/cc.3.12.1280. ↑ Katoh Y, Katoh M (Sep 2008). "Hedgehog signaling, epithelial-to-mesenchymal transition and miRNA". Int J Mol Med. 22 (3): 271–5. ↑ Micalizzi Ds; Farabaugh SM; Ford HL (2010). "Epithelial-Mesenchymal Transition in Cancer: Parallels between Normal Development and Tumor Progression". J Mammary Gland Biol Neoplasia. 15: 117–134. doi:10.1007s/10911-010-9178-9. ↑ Kang Y, He W, Tulley S, Gupta GP, Serganova I, Chen CR, Manova-Todorova K, Blasberg R, Gerald WL, Massagué J (2005). "Breast cancer bone metastasis mediated by the Smad tumor suppressor pathway". PNAS. 102 (39): 13909–14. doi:10.1073/pnas.0506517102. PMC 1236573 . PMID 16172383. ↑ Chang C, Chao C, Xia W, Yang J, Xiong Y, Li C, Yu W, Rehman SK, Hsu JL, Lee H, Liu M, Chen C, Yu D, Hung M (2011). "p53 regulates epithelial-mesenchymal transition (EMT) and stem cell properties through modulating miRNAs". Nat Cell Biol. 13 (3): 317–323. doi:10.1038/ncb2173. ↑ Lim R, Thiery JP (2012). "Epithelial-mesenchymal transitions: insights from development". Development. 139: 3471–3486. doi:10.1242/dev.071209. 1 2 Hay ED (2005). "The mesenchymal cell, its role in the embryo, and the remarkable signaling mechanisms that create it". Dev Dyn. 233 (3): 706–20. doi:10.1002/dvdy.20345. PMID 15937929. ↑ Kerosuo L, Bronner-Fraser M (2012). "What is bad in cancer is good in the embryo: Importance of EMT in neural crest development". Seminars in Cell and Developmental Biology. 23 (3): 320–332. doi:10.1016/j.semcdb.2012.03.010. ↑ Ahmed N, Maines-Bandiera S, Quinn MA, Unger WG, Dedhar S, Auersperg N (2006). "Molecular pathways regulating EGF-induced epithelio- mesenchymal transition in human ovarian surface epithelium". Am J Physiol Cell Physiol. 290 (6): C1532–C1542. doi:10.1152/ajpcell.00478.2005. ↑ Chaffer CL, Weinberg RA (2011). "A perspective on cancer cell metastasis". Science. 331 (6024): 1559–1564. doi:10.1126/science.1203543. PMID 21436443. ↑ Massague J (2008). "TGFβ in cancer". Cell. 134: 215–229. doi:10.1016/j.cell.2008.07.001. PMID 18662538. ↑ Chu IM, Lai WC, Aprelikova O, El Touny LH, Kouros-Mehr H, Green JE (2013). "Expression of GATA3 in MDA-MB-231 triple-negative breast cancer cells induces a growth inhibitory response to TGFß.". PLoS ONE. 8 (4): e61125. doi:10.1371/journal.pone.0061125. PMC 3620110 . PMID 23577196. 1 2 Nouri M, Ratther E, Stylianou N, Nelson CC, Hollier BG, Williams ED (2014). "Androgen-targeted therapy-induced epithelial mesenchymal plasticity and neuroendocrine transdifferentiation in prostate cancer: an opportunity for intervention". Front Oncol. 4: 370. doi:10.3389/fonc.2014.00370. PMC 4274903 . PMID 25566507. ↑ Kajiyama H, Shibata K, Terauchi M, Yamashita M, Ino K, Nawa A, Kikkawa F (2007). "Chemoresistance to paclitaxel induces epithelial-mesenchymal transition and enhances metastatic potential for epithelial ovarian carcinoma cells". Int J Oncol. 31: 277–283. doi:10.3892/ijo.31.2.277. ↑ Mani SA, Guo W, Liao MJ, Eaton EN, Ayyanan A, Zhou AY, Brooks M, Reinhard F, Zhang CC, Shipitsin M, Campbell LL, Polyak K, Brisken C, Yang J, Weinberg RA (2008). "The epithelial-mesenchymal transition generates cells with properties of stem cells". Cell. 133 (4): 704–15. doi:10.1016/j.cell.2008.03.027. PMC 2728032 . PMID 18485877. ↑ Singh A, Settleman J (2010). "EMT, cancer stem cells and drug resistance: an emerging axis of evil in the war on cancer". Oncogene. 29: 4741–4751. doi:10.1038/onc.2010.215. ↑ Fischer, Kari R.; Durrans, Anna; Lee, Sharrell; Sheng, Jianting; Li, Fuhai; Wong, Stephen T. C.; Choi, Hyejin; El Rayes, Tina; Ryu, Seongho (2015-11-26). "Epithelial-to-mesenchymal transition is not required for lung metastasis but contributes to chemoresistance". Nature. 527 (7579): 472–476. doi:10.1038/nature15748. ISSN 0028-0836. PMC 4662610 . PMID 26560033. ↑ Zheng, Xiaofeng; Carstens, Julienne L.; Kim, Jiha; Scheible, Matthew; Kaye, Judith; Sugimoto, Hikaru; Wu, Chia-Chin; LeBleu, Valerie S.; Kalluri, Raghu (2015-11-26). "Epithelial-to-mesenchymal transition is dispensable for metastasis but induces chemoresistance in pancreatic cancer". Nature. 527 (7579): 525–530. doi:10.1038/nature16064. ISSN 0028-0836. 1 2 Shamir, Eliah R.; Pappalardo, Elisa; Jorgens, Danielle M.; Coutinho, Kester; Tsai, Wen-Ting; Aziz, Khaled; Auer, Manfred; Tran, Phuoc T.; Bader, Joel S. (2014-03-03). "Twist1-induced dissemination preserves epithelial identity and requires E-cadherin". The Journal of Cell Biology. 204 (5): 839–856. doi:10.1083/jcb.201306088. ISSN 0021-9525. PMC 3941052 . PMID 24590176. ↑ Gershengorn MC, Hardikar AA, Wei C, et al. (2004). "Epithelial-to-mesenchymal transition generates proliferative human islet precursor cells". Science. 306: 2261–2264. doi:10.1126/science.1101968. ↑ Gershengorn MC, Geras-Raaka E, Hardikar AA, et al. (2005). "Are better islet cell precursors generated by epithelial-to-mesenchymal transition?". Cell Cycle. 4: 380–382. doi:10.4161/cc.4.3.1538. ↑ Atouf F, Park CH, Pechhold K, et al. (2007). "No evidence for mouse pancreatic beta-cell epithelial-mesenchymal transition in vitro". Diabetes. 56: 699–702. doi:10.2337/db06-1446. ↑ Chase LG, Ulloa-Montoya F, Kidder BL, et al. (2007). "Islet-derived fibroblast-like cells are not derived via epithelial-mesenchymal transition from Pdx-1 or insulin-positive cells". Diabetes. 56: 3–7. doi:10.2337/db06-1165. ↑ Morton RA, Geras-Raaka E, Wilson LM, et al. (2007). "Endocrine precursor cells from mouse islets are not generated by epithelial-to-mesenchymal transition of mature beta cells". Mol Cell Endocrinol. 270: 87–93. doi:10.1016/j.mce.2007.02.005. ↑ Russ HA, Bar Y, Ravassard P, et al. (2008). "In vitro proliferation of cells derived from adult human beta-cells revealed by cell-lineage tracing". Diabetes. 57: 1575–1583. doi:10.2337/db07-1283. ↑ Russ HA, Ravassard P, Kerr-Conte J, et al. (2009). "Epithelial-mesenchymal transition in cells expanded in vitro from lineage-traced adult human pancreatic beta cells". PLoS ONE. 4: e6417. doi:10.1371/journal.pone.0006417. ↑ Joglekar MV, Joglekar VM, Joglekar SV, et al. (2009). "Human fetal pancreatic insulin-producing cells proliferate in vitro". J Endocrinol. 201: 27–36. doi:10.1677/joe-08-0497. ↑ Nakaya Y, Sheng G (2013). "EMT in developmental morphogenesis". Cancer Lett. 341 (1): 9–15. doi:10.1016/j.canlet.2013.02.037. PMID 23462225. ↑ Micalizzi DS, Farabaugh SM, Ford HL (2010). "Epithelial-mesenchymal transition in cancer: parallels between normal development and tumor progression". J Mammary Gland Biol Neoplasia. 15: 117–134. doi:10.1007/s10911-010-9178-9. PMC 2886089 . PMID 20490631. 1 2 Tian XJ, Zhang H, Xing J (2013). "Coupled reversible and irreversible bistable switches underlying TGFβ-induced epithelial to mesenchymal transition". Biophys. J. 105 (4): 1079–89. doi:10.1016/j.bpj.2013.07.011. PMC 3752104 . PMID 23972859. 1 2 Zhang J, Tian XJ, Zhang H, Teng Y, Li R, Bai F, Elankumaran S, Xing J (2014). "TGF-β-induced epithelial-to-mesenchymal transition proceeds through stepwise activation of multiple feedback loops". Sci Signal. 7 (345): ra91. doi:10.1126/scisignal.2005304. PMID 25270257. ↑ Lu M, Jolly MK, Levine H, Onuchic JN, Ben-Jacob E (2013). "MicroRNA-based regulation of epithelial-hybrid-mesenchymal fate determination". Proc Natl Acad Sci USA. 110: 18144–18149. doi:10.1073/pnas.1318192110. PMC 3831488 . PMID 24154725. ↑ Savagner P (2010). "The epithelial-mesenchymal transition (EMT) phenomenon". Ann Oncol. 21: vii89–92. doi:10.1093/annonc/mdq292. PMC 3379967 . PMID 20943648.